Hello Dear, welcome to Teletalk 29 TK Recharge Offer 2017. 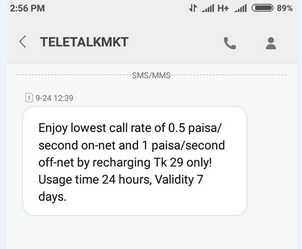 The Bangladeshi Government telecommunication company Teletalk brings a special call rate offer, where a user get 0.5paisa per second call rate any Teletalk number and 1paisa per second any local number by recharging 29 Taka. All the Teletalk prepaid connection users are eligible to enjoy Teletalk 29 Taka recharge special call rate offer. If you are a Teletalk customers and received an SMS from “TELETALKMKT” same the below picture, just follow the below information. To activate the Teletalk 0.5p/sec Teletalk Number and 1p/sec any operator number special call rate offer, customers need to recharge exact 29 Taka. VAT + SD + SC include in 29 Taka. The validity of Teletalk Special call rate offer 7 days and validity starts from offer activation day. Customers can use the Teletalk 29TK Recharge Special call rate offer 24 hours. To check the remaining balance of Teletalk 29 Taka recharge offer, just dial *152#. Thanks for staying with us a long time and visiting Teletalk 29 TK Recharge Offer 2017 content. If you have any question about the Teletalk 29 TK recharge Supper call rate Offer 2017, just comment here. We reply as soon as possible.